We are almost there! Thank you to everyone so far who has liked our Facebook page. We are currently at 46,912 Facebook page likes. Wow! We would like to reach our goal of 50,000 Facebook this year and would love for you to help us do this. To show our appreciation to our new page followers we will be giving away a White Kids Cabin bed to 1 lucky new follower once we hit our goal! All you have to do, is LIKE our Facebook page, and SHARE the page to your Facebook friends. NO PURCHASE IS NECESSARY TO ENTER OR WIN. A PURCHASE WILL NOT INCREASE YOUR CHANCES OF WINNING. THESE TERMS AND CONDITIONS SHALL BE GOVERNED BY AND CONSTRUED IN ACCORDANCE WITH THE LAWS OF ENGLAND AND WALES. 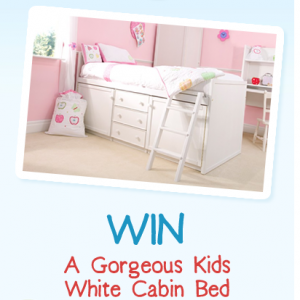 This Win A White Cabin Bed Contest (the "Contest") is open to legal residents of MAINLAND UK who are at least eighteen (18) years old at the time of entry. Employees of Sponsor (as defined below) and other companies associated with the promotion of the Contest, and their respective parents, subsidiaries, affiliates and advertising and promotion agencies, as well as the immediate family (spouse, parents, siblings, and children) and household members of each such employee, are not eligible. The Contest is sponsored by ETB Furniture, a Chester Limited Liability Company d/b/a Childrens Bed Centres ("Sponsor"), located at Unit 2 Minerva Court, Chester West Employment Park, Chester. The Contest begins on 23/09/2018 (Facebook page likes at 46,912) and ends when Childrens Bed Centers Facebook page reaches 50,000 page likes. (the "Contest Period"). Entries that are submitted before or after the Contest Period will be disqualified. Submissions will be accepted for the duration of the Contest Period. Facebook: Like Childrens Bed Centres Facebook Page. Must be a new page follower to win price. Limited one (1) submitted entry per person for the duration of the Contest Period, regardless of method of submission. Entries received in excess of the stated limitation will be void. On or about when the Facebook page reaches 50,000 likes the Sponsor will select the potential winners in a random drawing, without replacement, from among all eligible entries received. The odds of being selected depend on the total number of eligible entries. The potential winners will be notified by Facebook. The Sponsor will attempt to notify each potential winner via email on or about when the page reaches 50,000 likes.. If any potential winner cannot be contacted within five (5) business days after the date of the first attempt to contact him/her, or is disqualified for any reason, the Sponsor may select an alternate potential winner in his/her place at random from the remaining non-winning, eligible entries. Each winner will be required to complete, electronically sign and submit a Declaration of Compliance, in form as provided by Sponsor, within five (5) business days of the date notice or attempted notice is first sent, in order to claim his/her prize. If a potential winner cannot be contacted, or fails toe submit the Declaration of Compliance within the required time period, that potential winner forfeits the prize. If the potential winner is at least 18 but still considered a minor in his/her jurisdiction of residence, Sponsor reserves the right to award the prize in the name of his/her parent or legal guardian, who will be required to sign the Declaration of Compliance on the potential winner's behalf and fulfill any other requirements imposed on the winner as set forth herein. Potential winners must continue to comply with all terms and conditions of these Official Rules and with applicable law, and winning is contingent upon fulfilling all such requirements. Sponsor will take reasonable steps to ensure that all prizes are fulfilled within approximately 4-6 weeks after the conclusion of the Contest (the "Award Period"). 1 will be awarded. First prize is White Childrens Cabin Bed in Standard Size. Sponsor estimates that the value of the prizes are (in British Pound Sterling) £555 GBP respectively. The bed measures 100cm wide X 198cm long and is designed to fit a standard single mattress. Extras that may be pictured such as a mattress, bedding, ladder, cupboard shelves etc. are not included. Prizes are non-transferable, non-negotiable and no cash alternatives will be offered. Except where prohibited, each entrant agrees that any and all disputes, claims and causes of action arising out of, or connected with, the Contest or any prize awarded shall be resolved individually, without resort to any form of class action, and exclusively by the appropriate court located in Chester, and submits to the personal jurisdiction of such courts, waiving any and all objection thereto, including without limitation objection based on forum non conveniens. All issues and questions concerning the construction, validity, interpretation and enforceability of these Official Rules, entrants rights and obligations, or the rights and obligations of the Sponsor in connection with the Contest, shall be governed by, and construed in accordance with, the laws of England and Wales, without giving effect to any choice of law or conflict of law rules which would cause the application of the laws of any jurisdiction other than England and Wales. To request the name(s) of the Contest winner(s), send either: (a) a self-addressed, stamped envelope to [Unit 2 Minerva Court, Chester West Employment Park, Chester, Attn: Manager or (b) an email to enquiries@childrensbedcentres.co.uk. Winner list requests will only be accepted after the conclusion of the Award Period. By entering the promotion, the winner(s) consent to any publicity generated by the sponsor as a result of the promotion. The winner/s of the competition will need to make themselves available to accept delivery on a date specified by the sponsor. Whilst the sponsor will attempt to arrange a mutually convenient time they do not guarantee it. This promotion is in no way sponsored, endorsed or administered by, or associated with Facebook, Twitter, LinkedIn, Instagram or Google. You understand that you are providing your information to the owner of this contest and not to Facebook, Twitter, LinkedIn, Istagram or Google.